Japan’s ENE-FARM program is arguably the most successful fuel cell commercialization program in the world. ENE-FARM has supported the deployment of well over 120,000 residential fuel cell units and is providing proof that long term public-private partnerships can push new technology into the marketplace. New models coming on the market in 2015 are smaller, more efficient, cheaper and more easily installed than previous models. Models have been developed for apartment buildings as well as for homes and are being offered as a customer option by apartment complex developers, along with other appliance options. New units can operate independently if the power grid fails – a response to consumer concerns over electric power reliability in post-Fukushima Japan. While a number of companies have participated in development and early deployment, the main participants today are Panasonic and Toshiba, which offer PEM units, and Aisin Seiki, offering SOFC units. The PEM units are exceptionally durable, achieving greater than 60,000 hours while cycling daily, an achievement that a few years ago would have been regarded as wildly impossible. Panasonic claims its 2015 model achieves 95% combined heat and electrical efficiency. Earlier models were estimated at 80% to 90%, and manufacturers compare those efficiencies to grid efficiency of 35% to 40%. The units operate in partnership with the grid, cycling on and off in response to the home’s demand for electricity and hot water. The overall result is a reduction of as much as 50% in household CO2 emissions, and a consumer electricity cost savings of ¥60,000 to ¥75,000. Osaka Gas, which is offering fuel cell units in combination with rooftop solar power for new homes, claims even better performance, a 57% reduction in household CO2 and a consumer savings of ¥129,000. Japan’s interest in residential fuel cells dates to the 1999. The Millennium Project included support for PEM research. Japan’s residential energy sector is relatively large as a percentage of total demand, and the sector has been growing as consumers have developed higher expectations for housing. A large scale demonstration program, totaling 3,300 units, began in 2005 and was successful enough to justify commercial launch in 2009, supported by a deep government subsidy. The commercial program included a collective marketing strategy called ENE-FARM, which carried out a consumer education and advertising strategy complete with a cute cartoon monkey and humorous video advertising that generated a very high level of consumer awareness. The average Japanese person may not know what a fuel cell is, but very likely has heard of ENE-FARM. Natural gas suppliers have begun doing more of their own marketing but the ENE-FARM brand endures. The ENE-FARM program is a model public-private partnership. In 2009, the government agreed to pay ¥1.4 million per unit, or up to half the unit cost, and made a multi-year commitment with a declining subsidy per unit, but an increasing overall budget. About 2,300 units were installed in 2009; the number installed has grown steadily to more than 120,000, while the per-unit subsidy has declined to ¥500,000 to ¥600,000. Sales have approximately doubled annually since 2012. 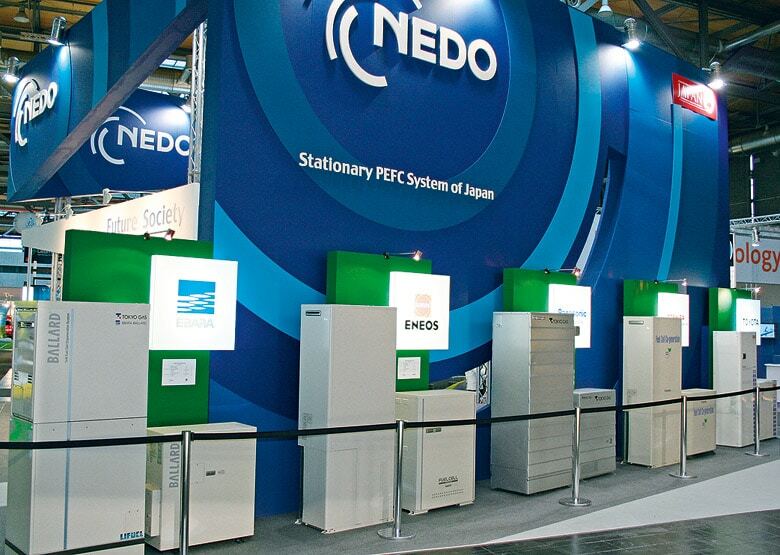 The 2015 budget for ENE-FARM subsidies is ¥22.2 billion, according to a government presentation at the 2015 FC Expo, a showcase for Japan’s fuel cell programs. Subsidies are scheduled to end at the end of next year. Discussions have begun with the government to develop a follow-on support program. Meanwhile, residential fuel cell companies are looking to Europe for new markets. The commitment to hydrogen in Japan’s new Fourth Energy Plan certainly is based in part on the exceptional success of Japan’s commitment to residential fuel cells. The ENE-FARM program demonstrated the capability of fuel cells and the capacity of developers to improve their products rapidly given a significant early market. Japan’s “central role” for hydrogen includes targets of 1.4 million residential units by 2020 and 5.3 million by 2030 (about 10% of Japan’s homes). Japan is exploring hydrogen pipelines to support these units, hybrid and micro-grid systems to take advantage of generating capacity and make room for slightly larger SOFC systems, and, of course, a transition from petroleum to hydrogen for transportation. In US ; “no cojones” businesses are happy to talk about what could be done , if only . Fuel cells have always been an interest to me when I found that NASA used them on every space flight I had always imagined they would have been too expensive for home use. The idea of going off grid and to be independent of political whim is rather appealing. Could you send me how your unit works and possible costs here in Australia? I would love to have “ENE-FARM” for my own home is the US, and how much does it cost?